Kroll's Map of the Seattle Central Business District, known in short as the Seattle CBD. This useful map shows all the building names, street names, one-way streets, and highway interchanges. The color version of this map is produced digitally and is thus kept current with the most recent changes. 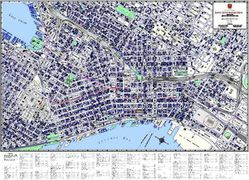 The most up to date and detailed map of downtown Seattle made by a local seattle mapping enterprise! !